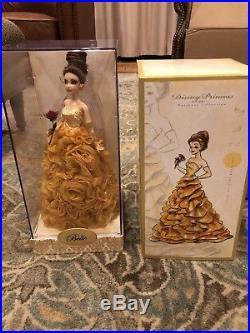 Disney Princess Designer Belle Doll. She is brand new, has never been displayed and her case has never been opened. 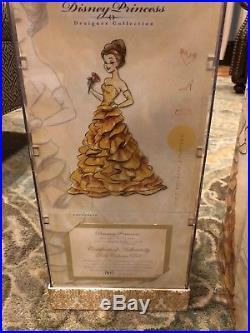 Belle shines like gold treasure as this exquisite Disney Princess Designer Doll re-imagined by Disney artists. The beauty holds a red rose while flaunting an opulent chestnut updo and a luxurious bouquet of golden ruffled roses on her iconic dress. This elegant Designer Collection Belle doll was carefully crafted by Disney artists to re-imagine the magic and style of the classic Disney Princesses. Inspired by the iconic fashions of these beloved characters, this limited edition Belle doll was brought to life with thoughtful attention to detail to uniquely capture the essence of the Beauty and the Beast heroine, creating a one of a kind doll collection that will be a treasured keepsake of collectors, Disney fans, and every princess at heart! Dramatic make-up and rooted eyelashes. Strapless gown with rhinestone bodice with a bouquet of ruffled roses for the skirt. Gold gloves with rhinestones. From a smoke free pet free home. 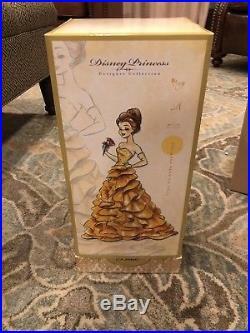 The item “Disney Princess Designer Doll Belle Limited to 8000 Disney Store” is in sale since Monday, August 27, 2018. This item is in the category “Collectibles\Disneyana\Contemporary (1968-Now)\Limited Editions”. The seller is “btrader13″ and is located in Tyler, Texas. 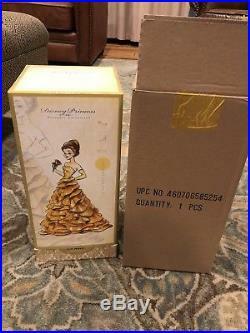 This item can be shipped to United States, Canada, United Kingdom, Denmark, Romania, Slovakia, Bulgaria, Czech republic, Finland, Hungary, Latvia, Lithuania, Malta, Estonia, Australia, Greece, Portugal, Cyprus, Slovenia, Japan, China, Sweden, South Korea, Indonesia, Taiwan, South africa, Thailand, Belgium, France, Hong Kong, Ireland, Netherlands, Poland, Spain, Italy, Germany, Austria, Israel, Mexico, New Zealand, Philippines, Singapore, Switzerland, Norway, Saudi arabia, Ukraine, United arab emirates, Qatar, Kuwait, Bahrain, Croatia, Malaysia, Brazil, Chile, Colombia, Costa rica, Panama, Trinidad and tobago, Guatemala, Honduras, Jamaica, Antigua and barbuda, Aruba, Belize, Dominica, Grenada, Saint kitts and nevis, Saint lucia, Montserrat, Turks and caicos islands, Barbados, Bangladesh, Bermuda, Brunei darussalam, Bolivia, Ecuador, Egypt, French guiana, Guernsey, Gibraltar, Guadeloupe, Iceland, Jersey, Jordan, Cambodia, Cayman islands, Liechtenstein, Sri lanka, Luxembourg, Monaco, Macao, Martinique, Maldives, Nicaragua, Oman, Peru, Pakistan, Paraguay, Reunion, Dominican republic, El salvador.